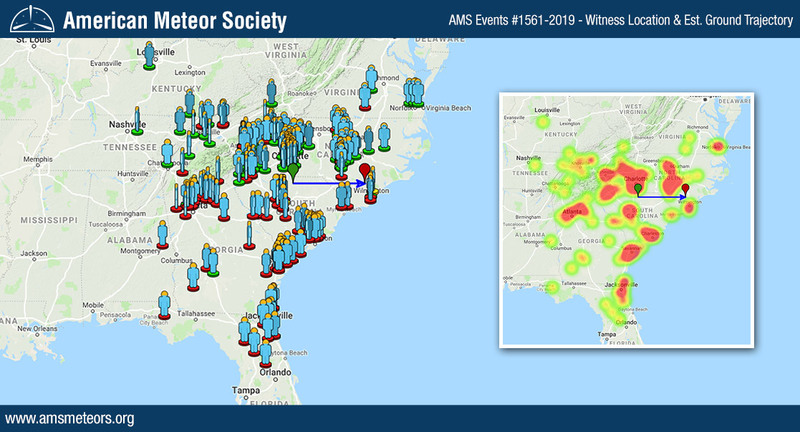 The AMS has received over 900 reports so far about of a slow and bright fireball seen above South and North Carolina on Thursday, April 4th 2019 around 6:50am EDT (10:50 Universal Time). The event was mainly seen from the Carolina’s but we also received reports from Alabama, Florida, Georgia, Kentucky, Tennessee and Virginia. 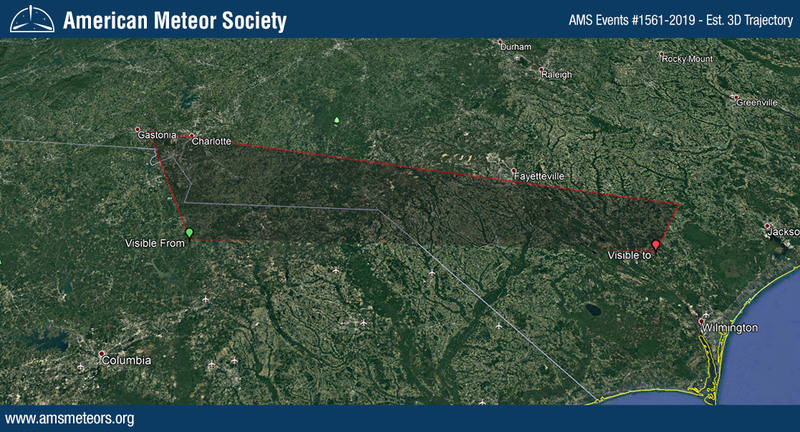 The preliminary 3D trajectory computed based on all the reports submitted to the AMS shows that the fireball was traveling from West to East and ended its flight East of Ivanhoe, NC. We also received numerous videos of the event from witnesses – all of them can been seen from the AMS Event #1561-2019 page. I was wondering if you have ever seen an bright green Fireball like the one I saw this morning at 0650? I saw the Fireball while walking to work in Charleston SC. It was bright green, had a green train. 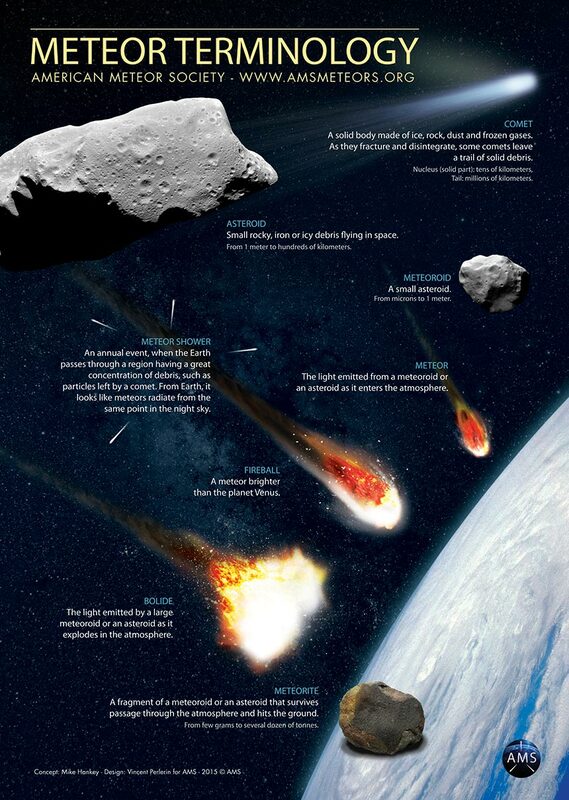 I have never seen a meteor for that long of period of time as it flew across the sky silently. I saw it this morning on my way to work at approximately 5:50Am CST. I was traveling north near Anniston AL. I also saw the fireball as I was headed to school on the bus. I saw it at around 6:50 am. I was just sitting and then I looked out the bus window and I saw a streak of blue and orange fire falling from the sky. It was cool. I saw a bright ball flying through the sky while I was outside taking the trash bag out that morning getting ready to leave for school around 6:45 and 6:50. I am for reals it was bright and beautiful you should have seen it!!!! My boyfriend works at Hancock and Moore Hancock and Moore Furniture in Taylorsville, NC. They had a fire drill around 6:50 am. The whole plant was outside and witnessed this event. I was in my way to work this morning and I was between lake city and live oak Florida, about 10 miles south of Wellborn, Florida. Very awesome thing to witness. I was on the way to work in Greenville NC around 8:45am when I saw the fireball. I saw it as I slowed for the stoplight at the airport. It was the slowest event I believe I ever witnessed. It seemed fairly low as well. It was larger and brighter than it showed in any of the videos. I see 2 times in this week same place same hour but different direction, 6:50 on my way to my work in the mountains, habersham. First time very close second time little mor e far. We were on our way home from our son’s baseball game tonight! Just saw one again in Charleston, SC!!! It was green and beautiful! We live in South Georgia and my husband seen it around 6am! I witnessed this fireball yesterday morning…and to think I was the only one to have seen it!! It was magnificent and grand as it flew through the quiet morning sky. A spectacular experience that meant much to me personally as a sign of “rebirth”…thank you Lord for such an event. All things are created by God…nature and the universe can speak to us!! In Maryville, TN and not only saw it walking into work but heard it. I looked up to find what sounded like the high pitched whine when you watch video of a bomb being dropped in older wars. I saw flames of orange and green. Then it fizzled out. There was a large group of us at Fort Gordon, GA conducting an APFT in a large open field. We had a great look at it for the entire time because there was nothing in the way of our view. Someone ask me what was that, so I said they are really going all out to promote this new Avengers movie. I saw one in Southern Pines, North Carolina Wednesday night around 9:50pm! My daughter and I saw it as we were driving to school Thursday morning, in Northern Hamilton County, East Tennessee. I believe I heard the meteor hit the ground. Milford Utau. Thought it was a earthquake,but it must of been that meteor everybody saw over there in the east. There was a violent sound from deep underground. Did anybody else hear in utau? I saw this meteorite moving West to East on my way to work in Tallahassee FL 6;49 A/M. I was going North, I was on the South side of town. It looked like a silver star, I was thinking satellite or ISS, but saw its trail as it was breaking up. I was near Kinard SC and around 6:40 am on April 4 2019, saw a blue/green fireball or Meteor fall for several seconds I was facing north eastward and it appeared to be falling from southwest to north eastward, I watched it until it disappeared behind the tree tops, it first appeared high or straight up when I noticed it.